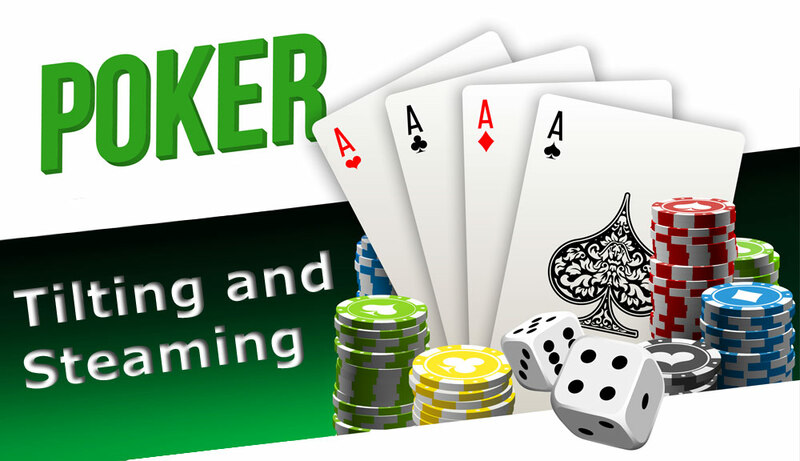 Poker is an intricate game with a vast array of factors that come into play and effect a player’s ability to win or lose money. Cards are one important element to the equation but perhaps even more important is a players mind set and mental state in a game. Cards, hands, winning, losing, other competitors all have an impact on a players mind set and how they deal with these things will have a huge bearing on how well they will do at the table. All poker players will know what is like to lose badly or feel humiliated by another player, whatever the reason, and then feel really angry or frustrated. These are bad states that a player wants to avoid as they are not conducive to optimal gaming and are what are sometimes called in poker ‘tilt’ and ‘steam’. The terms are sometimes used interchangeably but there are some differences. We will take a look at both Tilt vs Steam Poker and discuss some ways to avoid being in that situation in the future. Same say that the term tilt is a cross over from pinball where a machine that gets tilted too far will lock the flippers and result in a lost game. Tilt, or on tilt, is used to describe a player who has been outplayed or has lost and has been pushed over the edge into a frustrated anger that is effecting their game. Say, they have fallen for a bluff while holding an epic hand, or they are doing everything right with the cards they have got but get beaten by an opponent who gets lucky at the last minute. Sometimes smack talk at the table is enough to drive people over the edge into tilt. Psychology is huge in live poker and online poker, so negative table talk needs to be ignored to keep a player in the right head space. Whatever the reason, the outcome is the same – a frustrating rage that is negatively affecting their game. The key is to do your best to avoid it. Be self-aware and honest with yourself and devise tactics for preventing it from occurring, or if you find yourself on tilt for getting out of if. Steaming takes being on tilt to the next level. Now the player is no longer just angry and frustrated, now they have added desperation to the mix. This undesirable cocktail of negative mental states is now making them play badly in an effort to win back their money. They are now steaming to the point of boiling over and lashing out and getting really aggressive. Of course aggression is good in poker if it has a measure of control and direction, but devastating if uncontrollably unleashed. At best it is going to lead to silly calls, at worst a player may be asked to leave the game. When a player is steaming they are also probably losing as it is easier stay calm and in control when they are winning. If this is the case it could be beneficial to step away from the game as soon as you can and cool down – let off some steam as such. Like being on tilt the best way to avoid steaming is to not let yourself reach that level, but all poker players steam at some points so it pays to have some pre-planned strategies in place to stop steaming and get back to winning. These tips also apply to steaming and can be used as such. The first thing to develop is the ability to recognise if you are on tilt or steaming. Once you’ve caught it, you can then take steps at getting your emotions under control and your mental state back to normal. Try and discover your tilt triggers. We all have them, and if you can identify what they are you will be able to remain calm rather than let them rattle you. Accept that things are not always going to go your way no matter how well you play. Even if you are doing all the right things you can hit a downswing. This is natural and to be expected, just keep on doing the right things and in the long run this will even out. If things are really getting to you, and you know you are on tilt/steaming and you are trying to work through and keep calm but it is failing then simply take a break. Leave the game as soon as possible and take a breather. Clear your mind, balance your emotions and come back to the game later on to get back to winning.